are the major Wifi Chipset makers, but finding the best wifi module for your project can be a challenge. 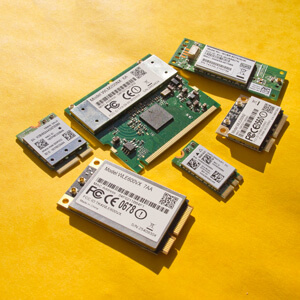 Are you looking for a special wireless module and need support? Name your application, we will find you the best solution. We do supply you with state of the art wifi modules and we are also able to source legacy devices which are sometimes very hard to find. Our wireless lan modules support a wide range of Operating Systems: WIN XP/2003/Vista/Windows 7/8/10, WIN CE 5.0/6.0 (x86/ARM), MAC OSX, freeBSD, Mikrotik OS, DD-WRT, Open-WRT and other Linux Distributions. We can supply wireless lan modules with the following interfaces: Minipci type IIIA, IIIB, minipci-express (Mini card), NGFF/M.2 (various KEY codings), USB 4 and 6 Pin and Type A Modules, SDIO Modules, Costum Size Modules. Modules with industrial working temperature support. Please contact us, we are glad to help you - providing you with the right solution. Scroll Down for Datasheets and Product catalogues. Highpower versions of most Atheros Chipsets available - please inquire. Most of these modules do support Windows WIN 7/Win 8/10 and Linux ATH9K/ATH10K drivers, some of these Chipsets also have MAC OS and Freebsd support. All these Ralink Chipsets have Windows WIN 7/8/10 and Linux support. WIN CE driver for x86 and ARM is available for most MediaTek Ralink Chipsets. We can also supply modules with other Mediatek Chipsets, just inquire please. All these Realtek Chipsets have Windows WIN 7/8/10 and Linux support (Android too), some have also MAC OS X Support. All these Broadcom Chipsets have Windows WIN 7/8/10 and Mac OS X support. Linux is only partial supported by B43 Linux Driver - please inquire for details.